The Solaire Deluxe Pedestal Gas BBQ Grill – 27″ brings outdoor entertaining to another level. 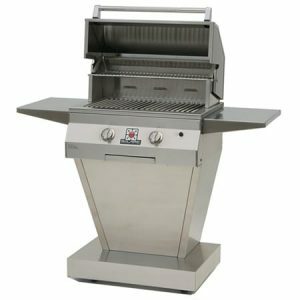 With its heavy duty stainless steel construction, this sleek grill promotes a modern style and a durable build. Perfect for enhancing large family gatherings or a simple Sunday brunch, this grill has options that will best suit your backyard. 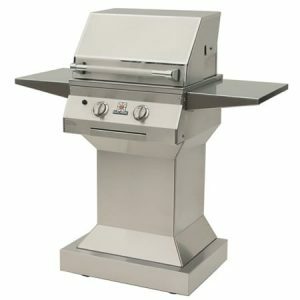 Mounted to an angular stainless steel pedestal with two attached side shelves gives, this grill boasts a unique, sophisticated look. This grill performs well with natural gas or liquid propane and has several cooking options to best reflect your outdoor cooking style. Optional rotisserie kit includes a 12,000 BTU rear infrared rotisserie burner, motor, spit rod, forks, and counter-weight. Infrared: Grills heat up in just three minutes, cooking your food twice as fast while keeping its excellent flavor. Many restaurants use grills like these to allow intense heat to enhance natural flavors and textures. In addition to using less fuel than other heating styles, infrared grills do not require a secondary heating element that can cause flare-ups from trapped grease. It does all of this while maintaining its sleek, modern style. Convection: Convection cooking, whether in your oven or grill, relies on gas or liquids to transfer heat. The heated molecules of air or water travel around the food to provide indirect, moist cooking. This can easily be compared to boiling a potato in water, or roasting a chicken in the oven. Promoting efficiency, convection burners feature a double-lance stainless steel ported U-burner that works with a stainless steel vaporizer plate to reduce flare-ups and provide quality heat distribution. 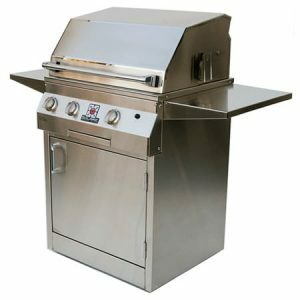 The Solaire Deluxe Pedestal Gas BBQ Grill – 27″ runs easily with push button rapid-start electronic ignition with burners that are easy to remove for cleaning or conversion. 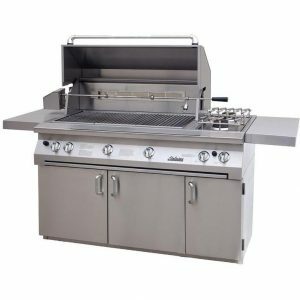 Simplify your outdoor kitchen area with a grill that will remain durable, while giving you an enjoyable experience. Keep the whole family happy by keeping the meal warm on the removable warming rack or attached drip tray. The stainless steel V-grilling grids will enhance the flavor of your meal, while its careful construction will reduce flare-ups.